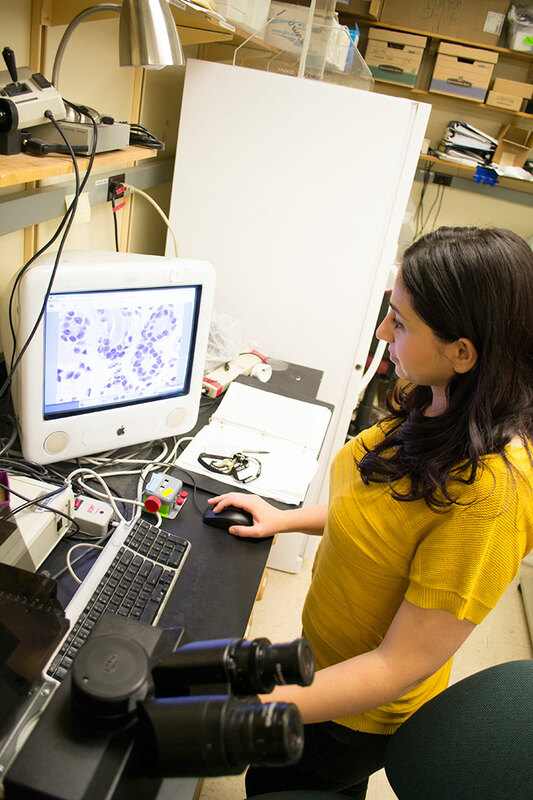 The majority of Farzaneh Atrian Afyani's research is spent in the lab. She is pictured studying the result of a tumor cell that was tested for drug response. Farzaneh Atrian Afyani is a doctoral student in the Purdue University College of Veterinary Medicine's Department of Basic Medical Sciences studying the importance of geometry and the microenvironment of cancer cells in regard to drug responsiveness. As a Burton D. Morgan fellow at Purdue, she has been able to advance her research and professional skills by exploring opportunities outside of the laboratory. Burton D. Morgan fellows are high-performing, student thought leaders in the area of entrepreneurship. Outstanding undergraduate and graduate students from across academic disciplines are selected every year. The program is designed to be a student-driven initiative, focused on educational leadership, mentorship and community building while supporting professional development. The program is funded by the Burton D. Morgan Foundation. Farzaneh's research centers on a device called "Disease on a Chip" (DOC), an in vitro cancer model used for drug screening, advancing the process of cancer diagnosis and prescribing the most compatible drug for the patient. "The DOC helps with decreasing the amount of human or animal testing, before cancer is diagnosed," Farzaneh said. "A tumor grows on the DOC, which matches the geometry and size of real tubular tissue." As a Burton D. Morgan fellow, Farzaneh attended the Lab on a Chip Microfluidics and Microarrays World Congress and the American Society of Cell Biology Meeting. Both offered opportunities to learn about product commercialization and research practices. "The Lab on a Chip Congress was on a smaller scale focusing on commercialization where I learned about the newest trends in the marketplace," Farzaneh said. "The Cell Biology Meeting is a prestigious meeting for cell biologists. Attendees range from scientists, professors, graduate students and industry professionals. I presented a research poster and started collaborating with a company on ways to improve my results. Since the events focused on both industry and science, I got to bring different perspectives into what I am currently working on." More recently, Farzaneh met with a mentor, Jan Lundberg, president of Eli Lilly's Research Laboratories. "Dr. Lundberg has explained the differences between academia and industry," Farzaneh said. "In future meetings I want to know more about personalized medicine, determining which drug is best for the patient, and how Eli Lilly is focusing on this issue and approaching solutions." Farzaneh credits the Burton D. Morgan Fellows program for allowing her to reach new heights in her research. "This was a new world for me because it is far from the lab and the work I do on a daily basis," she said. "I have enjoyed getting to know the other fellows and guest speakers. This experience has motivated me to think about my research from a business perspective."